Samsung revealed their Samsung Galaxy III today to a lot of anticipation. With the success of its predecessor, the Galaxy II, you can expect the bar to be set extremely high for the new and improved version. It seems that it has gained the approval of the masses and Samsung will once again challenge Apple's dominance in the market. Sporting a crisp and clear 4.8 inch HD Super AMOLED display capable of 720 x 1280 resolution, it comes close to Apple's Retina Display. Taking advantage of this display is a 8MP camera capable of 1080p video recording and a 1.9MP front-facing camera capable of 720p. Opening up the internals of Samsung's superphone, you will find a quad-chip with 1GB of RAM that will improve its overall performance, providing you with a lag-free experience. The large 2100 mAh battery will allow you to spend much more time using the phone while you're on the move without having to worry about battery life. "Smart Stay, which uses the forward-facing camera to determine if you're looking at the phone. You can set time intervals from as little as 15 seconds, which result in a small flashing eye logo in the Android notification bar. If it recognises that your eyes aren't focused on the phone anymore, the screen dims. Direct Call, which will auto-dial a contact if you have their contact details or a message open. By moving the phone to your ear, the proximity sensor; accelerometer and gyroscope all kick into use, and automatically dial the contact's number. Smart Alert, which will make the phone vibrate in your hand and flash an LED if you pick the phone up after a missed call. S Voice, which is a Siri-like voice recognition feature, that you can use to enquire about the weather; take a photo ("Hi Galaxy, please take a photo" to open the camera app, or "cheese" to snap it), and other tasks such as locking the phone, or controlling music. Each demand can be configured by the user. Social Tag, which links photos of friends in your photo gallery to their Facebook or Google+ accounts, using facial recognition. S Beam, which pairs other Galaxy S III phones (and only them, for now) via NFC, shares photos, videos, files or even albums of media over Wi-Fi. 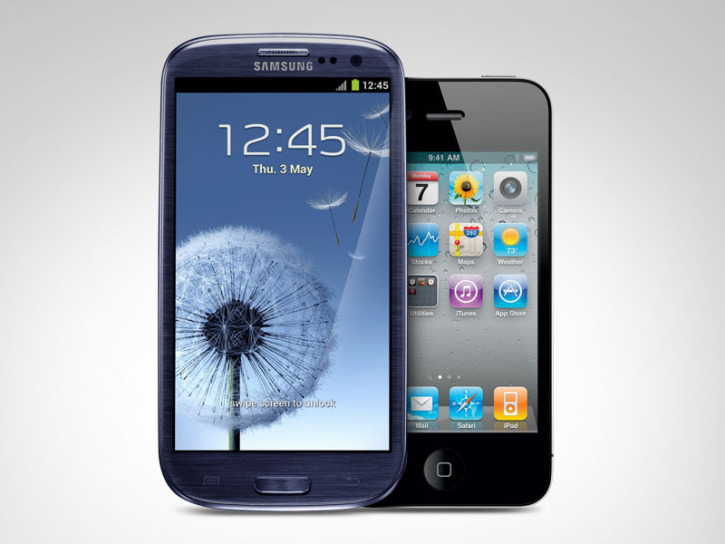 If your friend's S III doesn't have Wi-Fi enabled, S Beam will automatically turn that user's Wi-Fi on, and then off. AllShare Cast, which pairs to TVs, laptops or tablets over Wi-Fi, mirroring whatever's on the S III. You can also use the S III as a game controller. PopUp Play, which will literally pop a video out of its rendering it in a small thumbnail so you can continue watching while surfing the web or doing other functions on the phone. The thumbnail is movable around the display, even if it's pretty small." Samsung definitely hopes to continue to dominate the Android market and to gain a stronger foothold in the overall smartphone market with its latest upgrade of the Galaxy line. With the new features and smoother user experience, the refined Galaxy III is set for US release this summer.